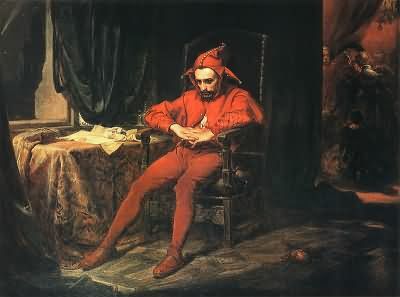 Court jester’s or Fools have their origins way back in time and records show that at the time of the Ming Dynasty (1368 -1644) that they occupied an important place within the court. In the UK they played an influential role in society and there is much evidence of this particularly during the mediaeval period. Contrary to popular belief many Jesters were accomplished musicians, were articulate and well read, they also had acrobatic skills and were clever in sleight of hand tricks. Very often their performances had political overtones, so it was not uncommon for them to lose their lives. 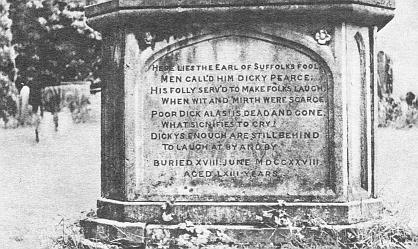 The last of the court jesters was Dicky Pearce he was the Earl of Suffolk’s fool, born in 1665 he eventually entered the service of the Berkeley family at Berkeley castle. In 1728 during a performance he overbalanced from the minstrel gallery and fell to his death. The question has been raised -did he fall or was he pushed he had apparently made fun of one of Lord Berkeley’s guests who had taken offence, the truth will never be known. Lord Berkeley had such high regard for him that he had him buried at Church of St.Mary in Berkeley village.